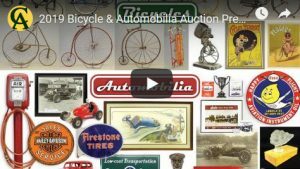 Bicycles / About – COPAKE AUCTION INC.
We’ve come a long way since our first bicycle auction back in 1991. We have never forgotten that it is you THE COLLECTOR that drives the market. 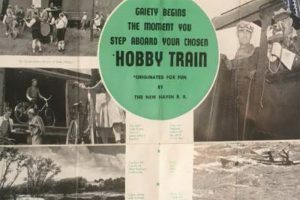 We have enjoyed bringing you some of the rarest and most desirable bicycles and related items over these many years. 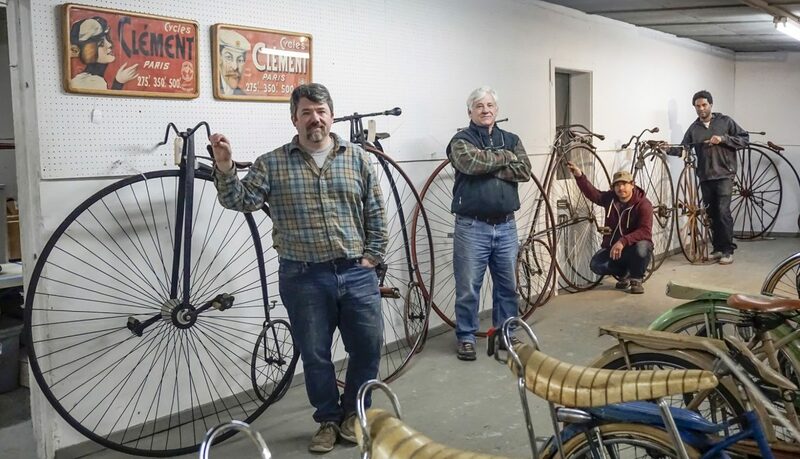 Michael Fallon’s passion for bicycles has propelled the Copake Auction to being one of the most popular and well respected antique bicycle auctions in the world. 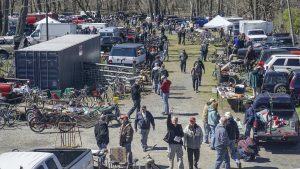 In addition to the auction itself we also host the pre-sale SWAP MEET right on the property in our spacious country fields. The swap meet has a sort of “Fair” quality to it and is a priority pit stop for all bicycle enthusiasts. We see people return year after year from every corner of the world for a day of shared admiration, deal hunting and riding stories, and of course Shopping and Trading! 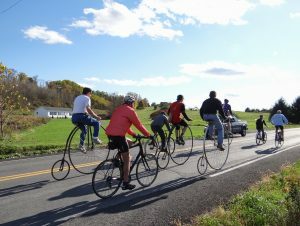 These two days are more than just about selling, we try to make it a fun and informative event with food, special presentations and a 10 mile ride through beautiful Columbia County New York on our bicycles! LOT 267. Rare 1911 Pierce four cylinder motorcycle. Running condition, never plated or painted. The Pierce Motorcycle Company was founded in 1909 by Percy Pierce, son of George Pierce, the legendary car and bicycle manufacturer. 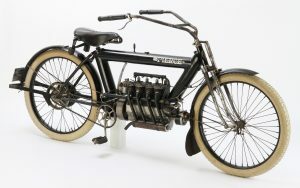 Debuted at the 1909 show at Madison Square Garden, Pierce offered the first four cylinder American Motorcycle. Gasoline and oil are contained in a tubular frame, having shaft drive, sprung fork, and pressure oiling. The first Pierce motorcycles have direct drive and single speed. In subsequent years a clutch and two speed transmission was added. These elegant expensive machines cost more to produce than the market would bear and in 1914, production ceased. This two speed example, in unrestored condition has been in long-term protected ownership, and is among the best known original examples. Only tires and hand grips have been replaced. All other components are correct and original. Ownership history is unknown, it bears a first year issue 1914 Pennsylvania enamel license plate, and includes a Pierce logo tool set. Although complete and in running condition, dissasembly and inspection is recommended before road use. 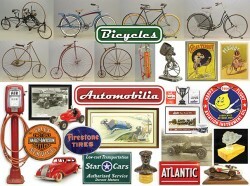 Are you interested in selling your Antique Bicycle, Memorabilia, Parts or Collectibles? 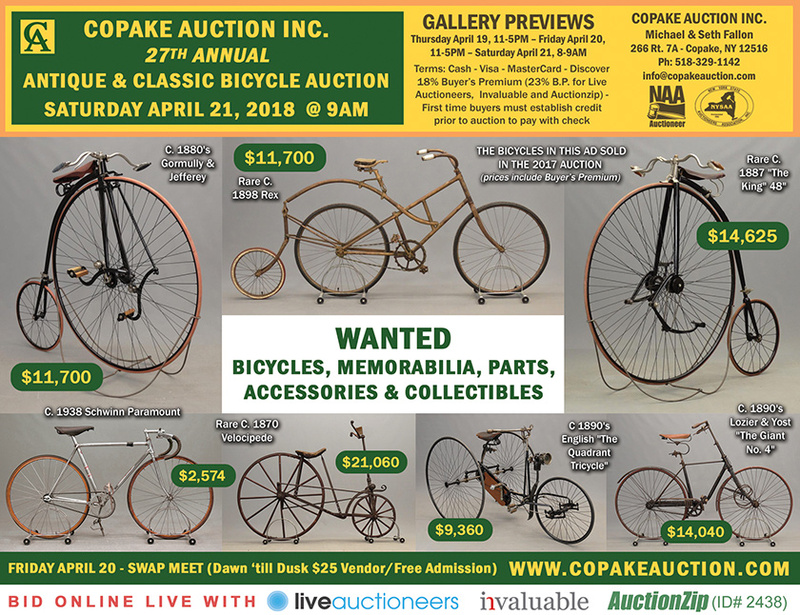 Copake Auction Inc. is the premier auction house in the world for selling bicycles, bicycle memorabilia, parts, accessories and collectibles. Mike Fallon asked this question after successfully selling some antique bicycles at one of our regular antique auctions, “If we put together an auction exclusively with bicycles & memorabilia would you come?”… a resounding “YES” was the answer and with the help of the late David Metz and others in the hobby the first Antique Bicycle Auction was a reality.